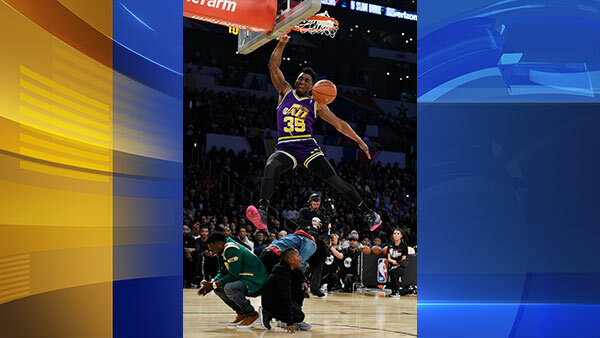 LOS ANGELES -- The NBA dunk contest was a throwback in many ways, with a 21-year-old rookie and a 25-year-old, third-year pro fighting it out for the trophy. Larry Nance Jr. rolled out his father's old uniform - down to the knee-high socks - and then rolled out his father himself to help with one of his dunks. Larry Nance Jr. put on quite the show in LA! But he came up short against Donovan Mitchell, the precocious Utah Jazz rookie with his own sense of history. Mitchell put on a show at Staples Center to win the slam dunk contest and cap off NBA All-Star Saturday. Mitchell edged Nance Jr. 98-96, sealing his victory with a close approximation of the 360-degree spin dunk that Vince Carter used to win the 2000 contest. "I wanted this so badly," Mitchell said. "This is one of my favorite events of All-Star weekend. To not only be in it, but to win it, it's crazy." Mitchell - three inches shorter than the 6-foot-6 Carter - needed a score of 47 to beat Nance, and he got a 48 from the five judges: DJ Khaled, Mark Wahlberg, Chris Rock and Hall of Famers Julius Erving and Lisa Leslie. Minutes earlier, Nance, who was trying to win the contest 34 years after his father won it, had earned a perfect 50 with a slam off a double alley-oop off the glass. "Growing up I was a big dunker," Mitchell said. "I wasn't much of a basketball player. I just dunked and played defense, and I watched a lot of Vince's videos. I've been seeing what he's been doing all year at his age, it's incredible. I figured at my size if I was able to get it, it would be a great dunk. It would finish it. "Actually, funny story, I haven't made that dunk in half a year. I tried in in practice the past two days. I tried it in practice this morning, didn't make it." Mitchell, the Jazz's 21-year-old guard out of Louisville, is among the NBA's top first-year players with a rookie-best 19.6 points per game. Though the 13th overall pick in last year's draft might seem slightly undersized for a high-flying dunk champion, he showed more than enough athleticism to compete with the league's best. Mitchell advanced to the finals with a creative dunk in the first round that used his sister, Jordan, as well as Kevin Hart and the comedian's son as props. For that dunk, Mitchell wore a Darrell Griffith Jazz jersey. Griffith participated in the first slam dunk contest in 1984. Mitchel's sister, Hart and the comedian's son, crouched in a line in front of the basket. Mitchell had an assistant toss the ball off the side of the backboard. He caught it and did a one-handed tomahawk dunk as he jumped over his sister, Hart and his son. It earned a perfect 50. "I appreciate Kevin Hart coming out there and helping me out," Mitchel said. "He's my favorite comedian." Nance wore his father's No. 22 Phoenix Suns jersey for his first dunk, replicating his dad's rim-rattling cradle windmill that won the contest in 1984. Nance was competing on his old team's home floor nine days after being traded from the Lakers to the Cleveland Cavaliers. "I felt great about it," Nance said. "I felt great about it last Thursday, and then I got traded. I didn't get to practice it again until yesterday." Later, Nance brought his dad out to toss him the ball for an alley-oop that earned a perfect score. "It was obviously a big moment for my family," Nance Jr. said. "It's something I will cherish forever." Victor Oladipo of the Indiana Pacers and Dennis Smith Jr. of the Dallas Mavericks were eliminated after the first round. Earlier, Devin Booker of the Phoenix Suns won the 3-point contest with a record 28 points in the final round and Spencer Dinwiddie of the Brooklyn Nets won the skills challenge. Booker beat 2016 champion Klay Thompson of the Golden State Warriors and Tobias Harris of the Los Angeles Clippers. Booker was sensational in the final round, when he missed only five of 25 shots. Dinwiddie, who played at Taft High in the Woodland Hills neighborhood of Los Angeles, beat Lauri Markkanen of the Chicago Bulls in the final round of the skills challenge, which included dribbling around pylons, passing the ball into a net and shooting 3-pointers.